"If Town Council supports the proposed zoning map amendment, DPCD recommends they refer Zoning By-law Amendment 18-820 to the Planning Board for a Public Hearing." The Economic Development Committee recommended that this measure come before the Town Council. The Town Council agenda for the Sep 5 meeting incorrectly listed the item as a first reading prior to approval. The supporting documents clearly stated it was meant to go to the Planning Board for their review and approval before coming to the Town Council to approve the zoning bylaw changes. The zoning changes are something that Franklin has been working on. Some of the plot lines don't align with the zoning categories. The Planning Dept review the plot lines and zoning and makes a recommendation for approval. 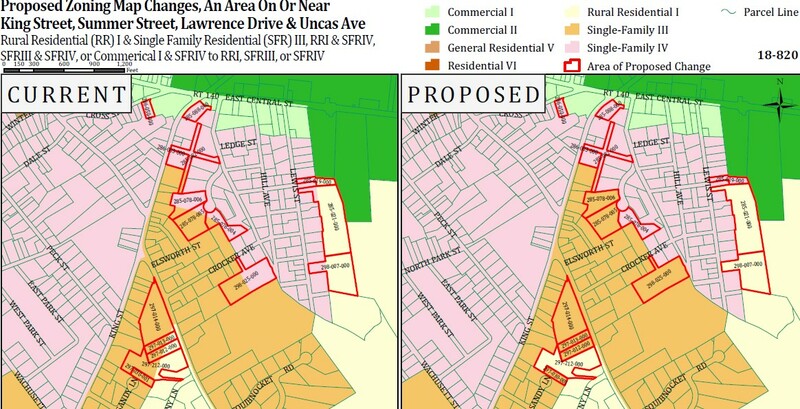 The Economic Development Committee reviewed the proposal, recommended some changes where a new subdivision would have gotten split into two different zones (it was changed to move to only a single zone) The proposal is now what is being discussed. My own property happens to be involved in this measure. Our plot is split almost evenly between two different but closely related residential zones. To clean up the map, the proposal puts all of the plot in a single zone. Our plot was split between Rural Residential I and Single Family Residential III. 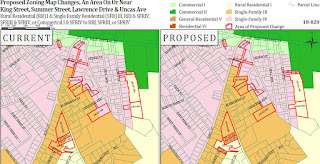 The proposal moves our plot totally within the Single Family Residential III zone. The detailed document from the Planning Dept used in the Sep 5 Town Council meeting. Our property is on this map too. We found the map confusing and with plot # typos. We can't attend Mon's meeting. Do you know if they are putting in a road to connect with Crocker. Or if the zoning changes will let folks to run a commercial business out of their house? No, simply plot line clean up. Some of the zoning changes over time didn't match the plots lines so they are bringing them inline. There is no practical change to the property itself. Any individual changes of use would still need to go through the formal approval process. The subdivision looks like it will exit to Crocker but since the build has stalled who knows when that will happen (if it does).